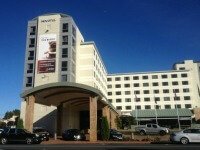 Rest easy with hotels in Rotorua chosen to meet your needs - because, your needs. 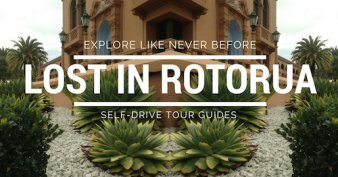 Rotorua doesn't have too many hotels, if you're talking real hotels that is. The range extends from so-so up to pretty good if you're not looking for LUXURY, luxury (there's talk on the street that a 5 star, luxury hotel is in the planning stages - oooo, stay tuned). You'll find that the following options cater to both the high-roller and the budget-conscious. All hotels are located within a 3km radius of the city centre, mostly closer. With that said, let's move on. Best feature? Location. The Millennium is on the edge of the central business district so it's handy to shops, restaurants and cafes. Do whatever you have to to snaffle a room overlooking the Polynesiean Pools and lake - sit out on the balcony and watch the steam from your morning cup of coffee meld with the steam from the Sulphur Flats rising to meet the dawn. If you're up that early of course. Then you can take a leisurely stroll or jog around the Government Gardens before the tourist buses get going. Mind you, some of them are out early too. 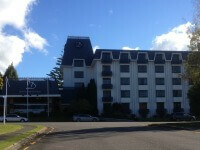 Overlooking Rotorua's racecourse, Rydges is another of the popular hotels in Rotorua. A rooftop swimming pool, ground-floor Atrium Restaurant & Bar and only a 1.6km, 20min walk or 5min drive to the middle of town. Family members and friends have stayed with no complaints, in fact they've enjoyed the spacious rooms and made use of the balconies overlooking the racecourse on one side of the building. The bathrooms may be dated but this place is value for money, even better when you get it on a deal. Bonus, one of Rotorua's top-rated restaurants, Urbano, is right across the road (may need to book for dinner). 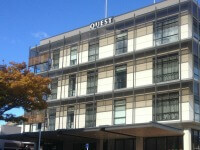 Quest is an apartment complex located in the heart of the city. Noise is not a problem at night because this area is deserted. We're not like huge cities where noise is 24/7. Make sure you have views to the west so you can see the sun going down from your hot tub (I seem to have a thing going on for the sun). Wine anyone? Chocolate-dipped strawberries? Eateries nearby include the not to be missed Le Café de Paris just a few doors along, Capers around the block and Eat Streat a 5min walk along Tutanekai Street towards the lake with other bars, restaurants and cafes on the way. 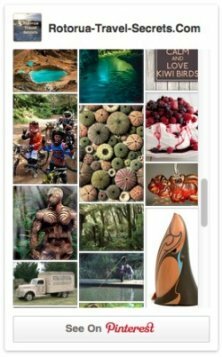 Have a meal then stroll to the lakefront, Government Gardens or Kuirau Park. The Distinction Hotel is a stone's throw from my place and every so often I go there for a voguish High Tea with my mum, playing ladies, as you do with High Tea. The food is dainty which makes me feel like a an overgrown bumbling fool but she loves it and that's the main thing when it comes to your mum, isn't it? My hairdresser, Beverley, is here too in case you need a quick styling or cut. The owner of the business is just as good too. 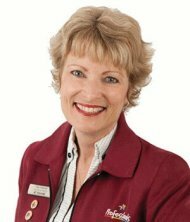 Beverley was recommended to me by my friend Carol who was a hairdresser, and there's no way Carol would use just anyone. Located towards the southern end of the city, it's a short 2.2km, 5min drive into the centre of town and 3.2km, 5min drive out to the mountain biking at Waipa. You can bike either way too which doesn't take too long. The rooms face west and east so either way you will have lovely views of the surrounds if you're on the higher levels. No air-con though. Favourites for visitors? The grotto spa pools and mountain bike facilities. 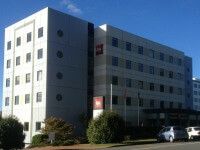 The Ibis is one of the more recent additions to the stable of hotels in Rotorua. Rooms face out over the village green on one side with the lake to the left. The rear view is a hill with the hospital at the top. Described as an economy hotel for business and leisure, it seems to attract numerous tour groups (make sure to ask for rooms away from them). The Ibis is a short stroll to the lakefront and restaurants on Eat Streat. The Novotel is one very nice hotel. Undertaken by a Thai lady, I think it was, she ensured that Feng Shui practices were adopted throughout the planning and building process. That might explain the ambiance of the place. You only have to walk inside to begin feeling relaxed. Like the Ibis, the Novotel also overlooks the village green and lakefront. And both are great hotels to stay at for New Years eve. From the upper floors you can see the festivities with fireworks and a free concert on the village green (events like this happens at other times too). I don't know why you would want to be inside though. Literally fall out the door onto Eat Streat and make sure to try an ice cream from Lady Janes. Best feature? 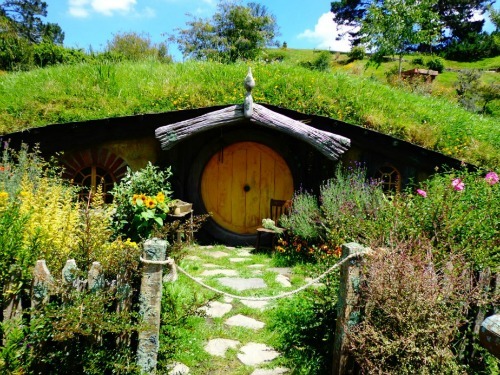 Located in the heart of Whakarewarewa with some rooms overlooking the village and the forest. A quiet, mostly sleepy kind of area. In saying that, make sure to ask for a room with views over the same and a balcony if possible. 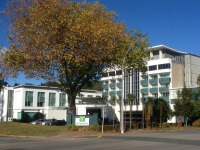 The Holiday Inn is one of the popular hotels in Rotorua where locals partake of the buffet lunch and dinner. It can get a bit squashed in the dining room. Isn't it the way that you overeat with these types of meals? Meal sittings are staggered. You'll need a car to get out and about as the Holiday Inn is located 3.0km, 6min drive out of the city center. If you don't mind walking, it would probably take about half an hour to get into town. 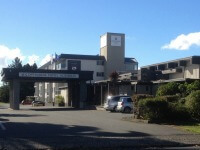 The Millennium - Copthorne hotel brand recently purchased the tired, badly in need of repair, Kingsgate Hotel and renamed it Copthorne Hotel Rotorua . Now, they are having to spend mega dollars upgrading it. Daily you see tradesmen up on the roof or else tearing boards and panels off. In saying that, the carpark is still full when events are on the calendar. More and more rooms are being upgraded so if you want to book in, ask for a renovated room. I'll keep my ear to the ground and report back once it's completed. It's a 2km, 5min drive or 20min fast walk into the city center. 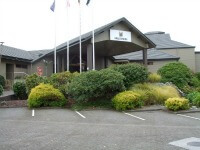 The Copthorne Hotel is also halfway between the city and Te Puia where you find the famous Pohutu Geyser and behind that the getting to be famous mountain biking forest. The Whakarewarewa Living Thermal Village is also in walking distance. There are no restaurants in the immediate vicinity apart from Urbano, a couple of blocks closer to the city (easy walk). Something else, if you enter the Rotorua - Taupo Flyer biking event, the check-in is at the rear of the Copthorne and the start line is on the side street of Ward Ave. If you're into second-hand shopping, Savemart is located on Gibson St at the rear of the hotel (it's the expensive one). Looking for something smaller. 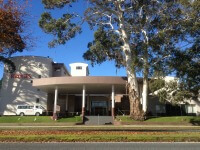 The Apollo Hotel is an apartment type complex, refurbished and re-branded in recent years. 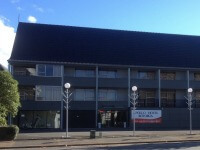 Located, like the Holiday Inn (in fact it's right across the road), in the heart of Whakarewarewa, it's a step out your door into the village proper. I don't know too much about this hotel but the majority of complaints, from what I can tell, arise from thin walls and inconsiderate people. Don't you hate that? Talk to staff about using the restaurant facilities across the road at the Holiday Inn which can be charged back. Like the Holiday Inn, you'll need a car to get out and about as the Apollo is located 3.0km and a 6min drive out of the city center. If the above hotels aren't enough for you, tucked within the luxury accommodation section of Rotorua Travel Secrets is the Princes Gate Boutique Hotel and Regent of Rotorua Boutique Hotel, Restaurant & Bar. Both establishments fully deserve their boutique status.